This one has a little star. That one has a little car. Say! What a lot of tots there are. Do your kids love Tiny Tots? Do they love Dr. Seuss? 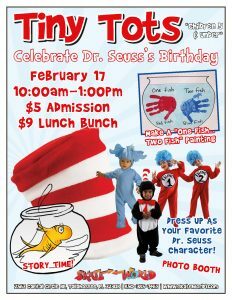 You’re invited to a very special Tiny Tots event to celebrate Dr. Seuss’ birthday! We’re taking a cue from the mischief makers in all of your kids favorite stories and throwing an upside down, inside out, crazy fun party. After all, no one is better at mayhem than toddlers; even certain hat-wearing cats! There’s just one rule: no eating birthday cake in the bath tub! Your kids don’t have to choose between story time and active play. At Tiny Tots they’ll have plenty of time for both! We’re celebrating the man who changed children’s literature forever. Dr. Seuss’s birthday is coming up on March 2nd! We’re celebrating a few weeks early with a special event for toddlers in Tallahassee. Dress up as your favorite character from Dr. Seuss’ stories! Toddlers have the most fun! Don’t miss the next Tiny Tots adventure next Friday.